Like Charles Conlon and George Brace, the late J.D. McCarthy was a gifted, prodigious photographer who specialized in pictures of major league baseball players. 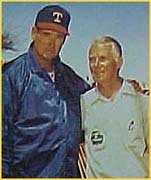 A rare photo of J. D. McCarthy, posing with Ted Williams in 1972.
although if you collected baseball cards in the 1960s, you have seen his work. From his base in the Chicago area, McCarthy snapped photos of some of the greatest players of all time from both the American and National Leagues and sold the shots to The Topps Company on a freelance basis. Striking as McCarthy's work for Topps was, however, it is his postcards that have caught the eye of modern day collectors. If a player liked a shot McCarthy took of him, the player could order a supply of postcards made from the photo. These postcards, in turn, were used for responding to requests for autographs. Many teams, the Pilots included, had photos taken of each player, but those were exclusively for press use. This created a large market for McCarthy and he eventually branched out, adding postcards of hockey and football players. 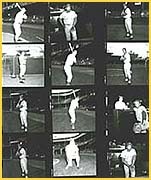 Although Ray Oyler and Bob Locker were the only Pilots to order postcards from McCarthy, two proof sheets still exist of the other players and it's from these proofs that the photos in this gallery are taken. McCarthy may have taken photos of other Pilots as well, although these photos have not surfaced as of this writing. Proof sheet of McCarthy's Pilots photos. Original McCarthy printing blocks for hockey postcards. made this determination is unknown. The photos were taken at Tiger Stadium between June 9 and June 11, 1969. Why McCarthy traveled to Detroit instead of taking these photos at Comiskey Park is also unknown, although it likely had to do with a scheduling conflict. In recent years, new postcards printed from McCarthy's negatives have appeared and some of his greatest baseball card photos have been included in commemorative sets. Perhaps through these re-issues, McCarthy will finally get the recognition he deserves. Because so little is known of McCarthy's life, we ask if you have any further information, that you please e-mail us to share your information.